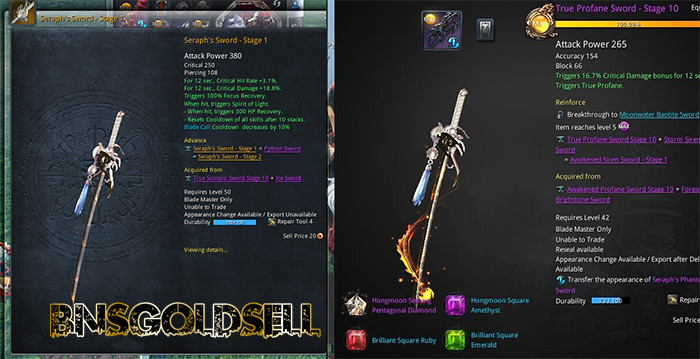 This is a guide to teach you how to choice legendary weapon for Force Master in Blade and Sou. If you want to buy Blade and Soul gold, BNSGoldSell is your best choice! Firstly, take a look at bellyful which is the one I am currently using. Baleful has basic trades crit damage, cetera focus recovery same product the art legendaries have. But the actual off to your damage is your frost pulp like no damage. Let us compare baleful to seraph from quick. So we compare it to the seraph upgrade here, which means you are actually looking at what it buffs there and your seraph it reduces the cooldown of your short fuse by 36 seconds. Your short fuse actually going to be one of the most important spells. This spell is what generates most your focus and also your best place to apply bleed. So if you actually want to solo bosses, whatever short fuse is very important to you. So it sounds to me like seraph’ way better than baleful. Tehn why whould you go baleful? The reason you go baleful is because of the product versus that’s seraph proc. Now if you look at the seraphs weapon, it says triggers a seraph effect when hit. Odd triggers 500 HP recovery will hit the reset all cooldowns me get ten steps. In other words, whenever you take damage, you have seraph up, you get one stack. You chance to give them stacks are not guaranteed to get one stack. That stack heels. You want to get 10 stacks, resets all your cooldowns. How often are you gonna get hit in PVE? I am gonna hit 10 times not to get that stack reset. You are not doing your job right. So that is seraph fact is actually pretty much worthless. Whereas we look at the baleful effect. On the other hand, it triggers odd increase of additional damage baed on her beeper save your attack power. Again, additional damage is not important. Only got 700 attack power, that is over a thousand additional damage and that stacks up to 10 times that would be why of substantial increase. Additional damage is not that important when you got three thousand or above additional damage, that gets pretty freaking awesome. On top of that, when you hit 10 stacks, again resets all of your cooldowns. And that is why you always want to go in for seraph. Because of that effect, although the defrost palm default effect is pretty much worthless, especially compared to reduce the cooldown short fuse that is freaking amazing. But why care about 36% reduction and short fuse comic is reset the entire called out that like every 30 seconds or so due to the baleful effect. And the baleful resets all of your cooldowns. That is gonna be your frost armor. It is very important, especially when you want solo bosses. The short fuse, the oxygen reduction does apply bleed, so that would be really good for slowing bosses, but said resetting all cooldowns including your short fuse which is just as good. Then go over the galaxy. Galaxy is extremely strong. A lot of people wonder what is better galaxy or bail for seraph. A lot of people debate the galaxies is the best of the three. A proper person offers will reduce the quantity treat which gives you a good defensive cooldown reduction, which doesn’t matter much in PVE. It gives you back focus recovery just like the other legendaries, give you crit damage. The proc is very strong. It is an unbelievably powerful proc and it gives your ridiculous light rain and defensive stats. This weapon is freaking amazing. The galaxy bangle is actually stronger the baleful bangle in almost every way. As a content comes out, eventually baleful is going to go the stage 12. And galaxies will also go to the stage 12. But one stage 12 both baleful and seraph how the option of going up to a chakra level of the level above available. Whereas galaxy will never have an upgrade path to power the actual level of galaxies far as we know. That means the charkra being about 50 times better than both baleful and seraph. That is like there is three times your damage. It is ridiculously powerful.